Fimo butterfly for a springtime motif – Flowers design step by step instruction. Begin at the left side of the fingernail tip and draw a easy swung line. Now draw with the nail art liner on the right and left side of the line two further swung lines, which meets each other at the tip. Fill the inner surface of the lines with the nail art liner in bright green. 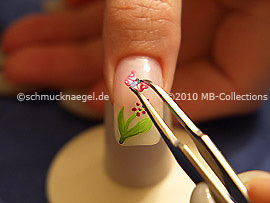 The nail art with Fimo butterfly for a springtime motif should correspond approximately to the picture. Draw with the nail art pen in the colour lavender several small points on the fingernail. 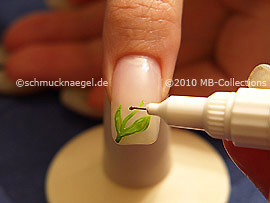 Set a drop of the clear nail lacquer on the fingernail, as attachment for the fimo butterfly. 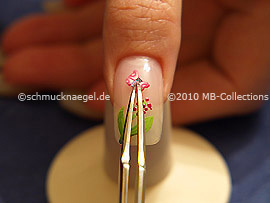 Take up with the tweezers the fimo butterfly and stick it on the damp clear nail lacquer. Now press with the tweezers the fimo butterfly on the fingernail surface. 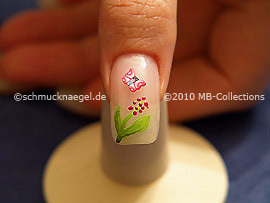 After the clear nail lacquer is dried, the nail art with Fimo butterfly for a springtime motif is finished. Fimo butterfly for a springtime motif was last modified: November 22nd, 2016 by Make it Smart e.K. Fimo animals, Nail art liner, Nail art pen.